Speed safety cameras save lives, including the thousands of Long Islanders who work and play on city streets. Long Island Streets was on the steps of City Hall, rallying for the expansion of speed safety cameras (S. 6046 / A.7798) at NYC schools with Families for Safe Streets, Transportation Alternatives, dozens of tireless advocates, public officials including Mayor de Blasio, NYS Senator's Golden, Peralto & Hoylman, NYS Assembly members De La Rosa, Gottfried & Simon, City Council members Ydanis Rodriguez & Van Bramer, DOT Commish Polly Trottenberg and a cluster of other allies in government. Cameras have proven to REDUCE SPEEDING by 67% YET 85% of traffic injuries and fatalities happen at places and times where the state won't allow speed cameras. That is ABSURD. There were several children speaking on behalf of their siblings and classmates lost, tragedies that could have been prevented with speed safety cameras. No child should have to stand up on the steps of City Hall and beg for traffic devices proven to work so they don't have to lose anymore playmates. 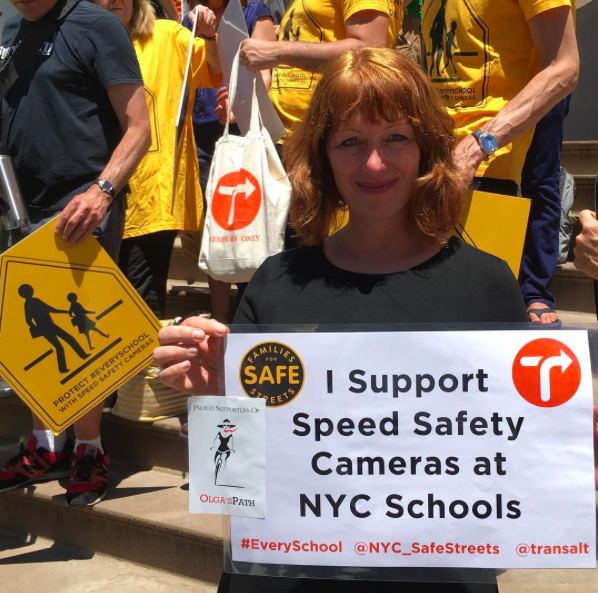 Expanding speed safety cameras in NYC school zones is not just for children. AARPNY was on hand with a message on behalf of seniors in New York: seniors make up 17% of New Yorkers and over 40% of traffic fatalities, speed safety cameras in school zones can prevent many senior fatalities & injuries. To read the June 2017 NYC DOT report on speed camera zones thus far, click here.